The list below is an old document I found, based on a survey of a community of knowledge managers, which lists possible incentives for seeking knowledge, and for sharing knowledge. In each case I have addressed intrinsic incentives (which come from within, such as altruism and curioistity), and extrinsic incentives which can be applied by others, such as recognition and reward. The italic text represents quotes from members of the knowledge management community which I surveyed, and can be considered to be the voice of experience, from grass-roots level. Payback The most effective intrinsic incentive for asking for help or looking for knowledge, will be when you receive help, or find knowledge, and profit by it. This leads to self-reinforcing behaviour. "The organisation as a whole will only achieve learning / sharing as a natural process when everyone has personally benefited by the sharing of someone else's experience (e.g. enabling a task to be done more easily / quickly / cheaply / reliably ... etc. ), and perhaps have seen their own experience shared with and used by others." Openness, or curiosity. Some people naturally look for knowledge, through curiosity, openness, or a spirit of inquiry. They are looking for effective solutions to the business problems, and are humble enough to realise they don't have all the answers. These people should be enrolled in the knowledge management process, and could make good knowledge managers. "The need/desire to learn comes from inside and the thirst for more of the same will, if the desire is from self motivation and not the motivation for a reward of any kind, grow." Security People need to feel secure in asking for help. There must be no mixed messages from management that make people feel that looking for outside knowledge is somehow cheating, or showing weakness or failure. Management can set a good example here by calling their own peer assists, and showing a willingness themselves to ask for help. Practicality. Any barrier to knowledge management may be used as an excuse not to do it. Make sure the processes and technology you use are simple and practical, and fit as closely as possible with established work practices. "The method of doing the networking has to be practicable, easy and effective: Undue extra burdens, from remote sources (i.e.outside your own Asset) can get relegated to low priority." Trust. People will happily ask for help from a group of people they know and trust. By forming a community of practice, especially if the community meets face to face, you can build a network of people with common interests who can develop a sense of trust and loyalty. "No matter how good technology is - people connect with people! It is all about mutual trust and respect!" Expectation. Ultimately, asking for help becomes the expected activity; a part of normal business. Everyone is doing it, and it becomes a surprise when people do NOT seek for knowledge. This incentive 'kicks in' after KM becomes established, and is the single most powerful extrinsic incentive for Knowledge Management. "I think the question " What have you done about lessons learned ?" gets asked more and more frequently these days, before sanction is given. I don't know of a case where sanction was refused due to a negative response, but I would be interested to hear if anyone has had that experience. In any case I'm sure that works." Encouragement. Personal encouragement and prompting may be very effective in promoting knowledge seeking, and this is part of the role of the knowledge manager or community moderator. Often an gentle reminder is all that is needed; sometime people just don't think to ask! "The key is encouraging people to "ask the question" not getting people to share per se! What I have found is that if somebody requests information, he will always receive feedback from his peers around the world (people will intuitively help people when they can - its in our nature, particularly when they are asked). What I can't help is when people don't ask in the first place." Reciprocity. "If I share my knowledge with you, perhaps you will share your knowledge with me". The reciprocity of sharing knowledge can be a powerful motivator, and can lead people to share what they know within an established community. A flip-side to this can be seen in businesses which have benefited from the knowledge of others, and feel they should reciprocate by providing their knowledge in return. "Because others shared their knowledge with me, I will share mine with them". The knowledge asset then begins to operate like a 'favour bank', with established reciprocal behaviour. Professional pride. Pride in your achievement is often an incentive for sharing knowledge when the project has been a success. The knowledge manager can use pride as a motivator when encouraging people to share their knowledge. Altruism. Altruism should not be under-rated. Some people feel a strong motivation to share knowledge for the benefit of other people, often people they do not know. This may particularly be the case with difficult or traumatic projects, where people can feel compelled to help others in similar predicaments in future. Altruism can be an important motivator in sharing safety knowledge from accidents, for example. Altrusitic individuals, with a strong drive to share knowledge with others, could make natural knowledge managers. Loyalty and friendship. Communities of practice often operate through trust, loyalty and friendship, which can be strengthened by face-to-face meetings. Members can feel an obligation to the community, which leads them to share knowledge for the benefit of their colleagues and friends. "Projects generally feel some moral obligation to prepare a close out report of some description. Usually difficult because they have forgotten what they did 3 years ago and it is completed after the key players have left the project. Close out reports don't get read very often but the motivation to produce them is still there." Expectation. Ultimately, managing knowledge has to become the default behaviour in a business unit. For this to happen, it needs the active endorsement of the BU leader, and a knowledge manager to watch the process. All new employees need to be introduced to the KM system, and use of the system needs to be encouraged, monitored and audited. "In our business unit we do our work under a system called Project Management System . Part of the process we go through is that the project team sit down when the project is complete to discuss what went well and what could have been done better. After this session, lessons that are worth carrying forward are distilled from the team comments and published on a board for the rest of the unit to see. We also keep an electronic record of the lessons each project have learnt on the server and the gems are put into our homepage. I think that the behavioural bit is now taken care of by the fact that "this is the way we do work around here". Encouragement. When knowledge sharing does NOT occur, it may be time for a little light intervention. One member maintains "You need to have somebody to badger people to capture the lessons, otherwise this will not happen. Even if this person does nothing else for KM, this role is still vital. If you don't badger, the whole system breaks down." This badgering can be a significant part of the role of the knowledge manager or community moderator. "At times, activity slumps and, after a while, I take this as the time to issue a little encouragement, either by posting some technical content or by trying to spark some discussion." Recognition. Recognition works on three levels; firstly it is a form of thanks, secondly it endorses knowledge sharing as valuable, and thirdly it can give the individual status as being clever or altruistic or both. One company sey up Knowledge Management Intranet awards so that the knowledge management team can recognise the efforts of others. Remember, recognition needs to be Personal, Immediate, Sincere and Specific (sorry about the acronym). "Some people developed a systematized approach to capturing and sharing knowledge in (X company) using a system where use went from 30 people contributing what they knew, to 1000 people in 2 months, after they introduced a flag which marked each bit of knowledge with the name of the person who contributed it. The flag stays with the knowledge forever - in this way, people knew they would be recognised whenever someone extracted their bit of knowledge from the system. This reinforces much of what we are learning about the importance of recognition, and is a fairly simple thing to do." Endorsement. Line Management can endorse the value of knowledge sharing if they lead the way in KM behaviours, for example by holding their own Retrospects or After Action Reviews. On the other hand, if they show no involvement in KM activity, they are implying that they see little value in it. One Knowledge Manager points out that "Managers need to 'walk the talk' in order to legitimise the time spent in transfer of knowledge." "I think the key is to make visible that we recognize the sharing activity as a valued behaviour. Profile people who have the behaviours we want....and we will see everyone start to act that way over time." Reward. 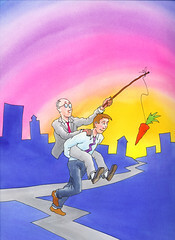 Financial reward may be the most concrete form of endorsement and recognition. Many of the respondents in the KM forum discussion did not feel that financial reward would be as effective as other incentives, ("In general, I don't believe you can financially incentivise someone to share; they have to want to do it") but financially rewarding non-KM behaviour could well be a dis-incentive. "The only sure way I see it working is to attach it (incentives) to the objectives/goals of the job and reward success when they happen. Our managers constantly talk about "team work" but still rewards individual successes. When we see true knowledge sharing, we need to reward it quickly."